The 'mystery' contrail is visible as a horizontal white streak in the middle of the lower left quadrant of this image, captured by the Geostationary Operational Environmental Satellite 11. The satellite is a partnership between NASA Goddard Space Flight Center and the National Oceanographic and Atmospheric Administration (NOAA). When an impressive contrail was spotted off the Californiacoast last week, it sparked widespread reports of a mystery missile launch inthe area ? a theory the Pentagon squashed after initial investigations. But, theodd contrail fooled more than the public and media, and was even seen fromspace. After watching footage of the Nov. 8 contrail, PatrickMinnis, a contrail expert in the Science Directorate at NASA's Langley ResearchCenter in Hampton, Va., assumed it came from a missile, as many others did. "She responded with links to two different blogs thatcompared it to older aircraft contrail pictures, and indicated that the blogauthors thought it was an aircraft contrail," Minnis said of the reporter. "I had not really thought about that aspect previously and, at firstglance, the video showed what lookedlike a missile launch. Once the idea that it was an aircraft contrailentered my head, I had to pay closer attention, because aircraft contrails arepart of my job description." Later, he learned that fellow NASA scientist Doug Spangenberghad pieced together a photo of the mystery contrail from space after sifting throughweather satellite images. Minnis typically studies contrails in order to determinetheir effect on Earth's climate. He and other scientists have discovered thatairplane contrails create cirrus clouds on days they wouldn't usually exist. According to his calculations, the cirrus-cloud cover overthe United States is increasing by 1 percent each decade as a result,effectively contributing to global warming by blocking the release of heat fromthe planet. Minnis used that experience to examine the Californiacontrail, which had been seen near Catalina Island, off the coast of LosAngeles. "It appeared to be between two high clouds, one inforeground and one in the background," Minnis said. "I would haveexpected that it was at the same level or above the high clouds, so it shouldhave been obscured more by the cloud in the background. Thus, I concluded againthat it was a missile." Minnis then tried a different approach, this time with the Spangenberg,who also works at Langley Research Center. 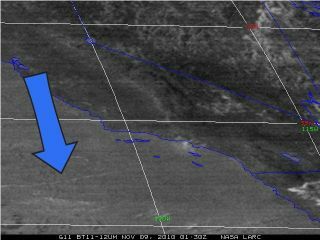 Spangenberg had sequenced imageryfrom the Geostationary Operational Environmental Satellite 11 (GOES-11) thatshowed a persistent contrail that could match the mystery contrail. With the help of other Langley researchers, Minnis alsolearned that on Nov. 9, conditions were "ripe" for persistentcontrails over the Pacific west of Los Angeles, but that the contrails wouldonly survive for a short time closer to the coast. "As it turns out, the high clouds seen in thebackground of the video were actually behind the contrail because the plane hadflown north of the clouds, and changed course to the northeast, so that theclouds were behind the contrail as viewed from Catalina Island," Minnissaid. "All of that information changed my mind." Based on his research, Minnis said he can't definitivelyprove that the contrail came from an airplane. But, it is the "mostlikely" scenario given the data. "Later, while viewing some blogs, I found that thecontrail corresponded remarkably well with flight AWE808, which flew fromHawaii to Phoenix; it showed the change in course to the northeast at the samelocation, further confirming my conclusion." After an initial investigation, the military quashedthe "mystery missile" scenario, with many other experts also suggestingthe contrail was caused by a run-of-the-mill jet aircraft. "While there is nothing at this time that leads theDepartment of Defense to believe this is a missile launch, the department andother U.S. government agencies with expertise in aviation and space continue tolook into the condensation trail (contrail) seen and reported off the coast ofsouthern California on Monday evening," DoD spokesman Col. Dave Lapan saidlast week.